Clever, Crafty, Cookin' Mama: Forty is the new 25! Forty is the new 25! So yesterday was a big event around here. It was my 40th birthday! When I was a kid, forty seemed so OLD. I remember my grandma with grey hair and glasses. She watched Lawrence Welk, took walks to the park, and called the couch a "davenport". If you had looked up "grandma" in the dictionary, you probably would have seen her cute picture right next to it. Come to find out, she was only in her sixties for my entire childhood! It was a different time back then. Looking back now, people from the older generation looked and acted older way before their time. Come to think of it, I have seen recent pictures of people taken in the 1970's and they look younger NOW in 2012 then they did in that old Polaroid. This picture was taken on my mom's wedding day back in June of 1969. Yes, yes, my mom is so young! I believe she was around 12-years-old (ok 20ish), and looked a lot like Molly Ringwald... but the lady in green to her right was my Grandma Carol. Isn't she sweet? When you say the word "Grandma" that's what I picture in my head. I love looking at old pictures from the past. I was born 3 years after this picture was taken, so when I was a kid, that's how a grandma was supposed to look. Now, take my adorable parents, in a picture taken 3 days ago. They too are in their 60's, have four kids, and 12 grand kids, but just LOOK at them! Are they not adorable and young looking? 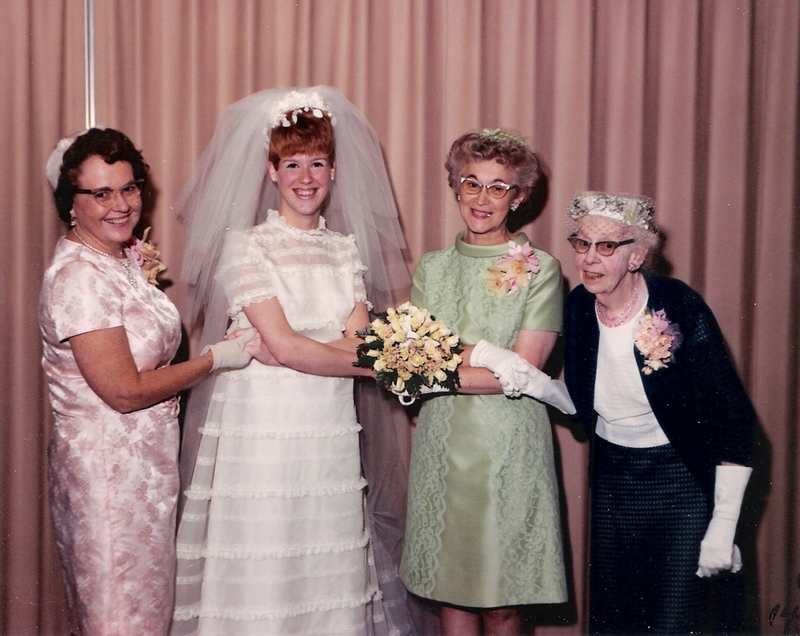 Does my mom look almost the same as she did as a beautiful 20-year-old bride? Pretty close. My point being that age is relative. You are as old as you want to be. If I can take my fun, young parents and model myself after them, you can be young in mind and spirit for many many years to come! So I don't look at 40 as a bad word, that I'm "over the hill" now, or it's the beginning of the "end". It's sort of a mid-point in your life to stop and see where you've been, what you have accomplished, and what your plans are going to be for the other HALF of your life! My and my cute hubby at my birthday dinner last night. My goals for the next 40-50 years are: to live each day to the fullest, try to encourage and teach as many people as I can, enrich the lives of others, to try new things and do them to the best of my ability, to be there for my friends, to be the best wife, mom, daughter, and sister I can be, and to treat each day like a gift, because that is what it is! My dad has a saying, "Life is a gift, tear it open". I plan to do just THAT! Happy Birthday to ME! Happy birthday, you young-lookin' whippersnapper!